Book of the Three Dragons by Kenneth Morris, Cold Spring Press, Cold Spring Harbor, NY, 2004; ISBN 1593600275, 232 pages, paperback, $11.95. Available from Theosophical University Press. In her 1973 landmark essay "From Elfland to Poughkeepsie," Ursula K. Le Guin singled out three writers as master stylists of fantasy: J. R. R. Tolkien, E. R. Eddison, and Kenneth Morris. Tolkien's writings are well-known, and Eddison's first novel, The Worm Ouroboros (1922), has considerable renown. But in 1973 the writings of Kenneth Morris were unknown to most readers. We owe it to Le Guin that, in the years since her essay was published, Morris has gained some of the acclaim that he deserves. Morris was born in Wales in 1879. As a child his imagination was nurtured by Welsh folktales and by the Mabinogion, the primary collection of Welsh mythological stories surviving from medieval times. Usually published as a book containing eleven tales, only four (each of which is named as a separate "branch") are considered to be part of the Mabinogion proper. Morris's father died when he was six, and the family moved to London, where he was educated at the famous school, Christ's Hospital. In 1896 he visited Dublin and encountered the Theosophical Society, which he joined enthusiastically. Morris remained devoted to theosophical ideals, such as the universal brotherhood of all mankind, for the rest of his life. In 1908 he moved to southern California to teach at the International Headquarters of the Theosophical Society. He stayed there — at Point Loma, near San Diego — for twenty-two years. In 1930 he returned to Wales, where he died in 1937 at the age of fifty-seven. I was in a very Welsh mood when I wrote the Fates — in 1910-1911 — and managed to write as if it were Welsh. Of course very few in Wales are interested in it: a few are. That piling up of adjectives in English is a dangerous ploy: the worst American after dinner ranters do it ghastlily. But there, with the robes of my Welshness and Welsh moods of thought on me, I walked along gaily oblivious of my peril. Having re-read Fates, and having "found the ornament so thick in places I lost the thread of story in reading," Morris determined that should not be the case with Book of the Three Dragons, and went to it "with a severe blue pencil, cutting out ornament left and right." Morris was correct to do so — Book of the Three Dragons shows a maturity of style well beyond that of the earlier book. It is also considerably more imaginative. 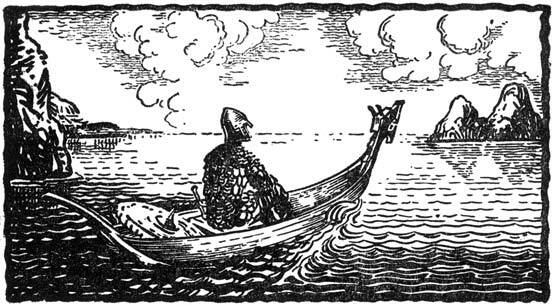 The Fates of the Princes of Dyfed is a fairly close retelling of the first branch of the Mabinogion, the story of Pwyll and his journey to the Otherworld. 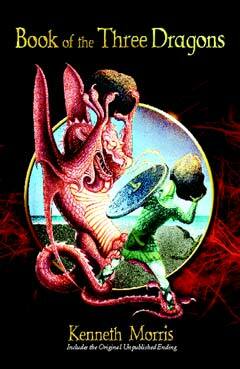 Book of the Three Dragons is Morris's recasting and reshaping of the other branches into a story of his own. Inexplicably, when it was first published the ending of Book of the Three Dragons was simply lopped off. The surviving correspondence is unclear, but evidently the publisher (Longmans, Green, & Co.) felt that the book was too long. This edition of Book of the Three Dragons publishes for the first time Morris's ending, his fifth and sixth branches, amounting to approximately one-third again as much as what was originally published. Book of the Three Dragons first appeared in September 1930. It was chosen as a selection of the Junior Literary Guild, and achieved more notice than any of Morris's other books. Favorable reviews appeared in the New York World, the New York Herald Tribune Books, the Atlantic Monthly, and the Horn Book. The Editors would like to share the following letter, concerning a book reviewed in February/March 2004. As you know, the Theosophical Publishing House in Wheaton, Illinois, published last year a volume entitled The Letters of H. P. Blavatsky, edited by Mr. John Algeo. Scattered all around in this first volume are nearly twenty of the so-called Solovyov Letters. Solovyov was a well-known and bitter enemy of the Theosophical movement and of HPB personally. He made many false accusations against her, as Sylvia Cranston demonstrates in her admirable biography, HPB: The Extraordinary Life & Influence of Helena Blavatsky. Further information on this subject is available in Blavatsky and Her Teachers by Jean Overton Fuller and in When Daylight Comes by Howard Murphet. Most of the letters "obtained" and "arranged" by Mr. Solovyov are addressed to Mr. A. N. Aksakoff, and leave the impression of HPB as a mean, morally and intellectually limited person obsessed by money. Unfortunately, Mr. Algeo, who is known to be a careful linguist and scholar, failed to mention that Mr. Solovyov, sole source of these texts, most likely forged these letters, completely or in part.